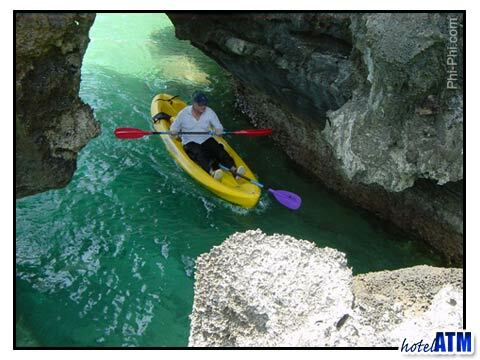 Phi Phi tour packages give you the door to door experience. The standard tour packages include all you might need on a tour like equipment, training, your food and water. Phuket Phi Phi tour packages also include your transfer from your hotel out to Phi Phi and back. Phi Phi tour packages are highly popular as Phi Phi island represents one of 'the' top natural beauty locations in Thailand. Where else can you find such dramatic scenery? The mountains, the cliffs the golden white sand of the beaches and 20 km of coral reef make this a 'one-off must see' place to visit. Phi Phi tour packages are needed to get you around the islands as there are no cars. Also you need transport to get to all the islands, reefs and beaches. Most people would feel they have not seen the islands until they have set foot on The Beach at Maya Bay. This is 'the' beach where Leonardo Di Caprio shot the movie "The Beach" about a backpackers searching for the flawless and unspoilt Thailand. Most Phi Phi tour packages start at Koh Phi Phi Don Village pier on Tonsai Bay. From here you take sightseeing, snorkeling, beach hopping or diving tours. My favourite are set out below. The Phi Phi tour package that screams out 'fun' but unfortunately has an early start. 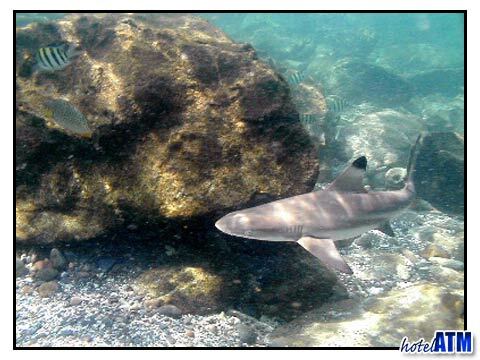 The Shark Watch snorkeling tour is a brilliant way to get the day started and gets you close up with the Black Tip Reef Shark. After an encounter with these predators the longtail boat take you out to Maya Bay where you can hang out and enjoy the glorious scenery and perahps swap stories from the morning's adventure. My other favourite Phi Phi tour package involves the other end of the day. The Sunset Snorkeling Tour of Phi Phi Ley takes you out to Maya Bay and Phi Phi Ley and as the sun drops you get a chance to enjoy the moment . Phi Phi doesn’t get many sunsets as most of the main accommodation is in the village which is in the shadow of the Tonsai Cliffs. The best sunsets on Phi Phi is an interesting article about this subject. Phuket Phi Phi tour packages take you from your Phuket hotel or resort which is probably on the west coast of the Phuket Island. The drive over the Phuket mountain range pass at Khatu or Kata takes you through some delightful forested scenery and down onto the eastern Phuket plain. The ferries and speedboat tours take you out from Phuket Town Rasada Pier or the Boat Lagoon or Phuket Royal Marinas. Sightseeing Phuket Phi Phi tour packages are best done from the cruise ship Sea Angel. This large vessel has promenade decks, on board refreshments, and lets you experience the Phi Phi and Phang Nga Bay islands in a comfortable way. The Phuket Phi Phi tour package by speedboat takes you from the Royal Phuket Marina and with a blast and a rush gets you out to the coral reefs at Bamboo Island before snaking and beach-hopping its way south to Maya Bay where the tour is finished off. The full list of Phi Phi Tour Packages include half and full day speedboat tours around Phi Phi, diving off Phi Phi Ley as well as a cruise and a speedboat tour from Krabi Province. Whatever tour suites you and wherever you are staying, time on Phi Phi without a Package tour is a great waste .